In its Weekly Report On Israeli Human Rights Violations in the Occupied Palestinian Territories for the week of 03 – 09 December 2015, the Palestinian Center for Human Rights (PCHR) found that Israeli forces continued systematic crimes in the occupied Palestinian territories throughout the week. 10 Palestinian civilians, including a child, were killed in the West Bank. 70 Palestinian civilians, including 21 children, a female journalist and a woman, were wounded in the West Bank and Gaza Strip. Israeli forces put into effect the house demolition policy on grounds of collective punishment. A house in Nablus was bombed, due to which a mosque and 5 nearby houses sustained material damage. A number of houses were surveyed and their occupants were threatened to leave their houses to be demolished. Israeli forces continued to target the border area along the Gaza Strip. 2 house sustained damage because of the Israeli shells. Israeli warplanes raided a training site in the Gaza Strip, but no casualties were reported. Israeli forces conducted 114 incursions into Palestinian communities in the West Bank this week. On Thursday, 03 December 2015, Israeli soldiers stationed at a checkpoint established at the intersection of Hezmah village, northeast of Jerusalem, killed Mazen Hasan Mohammed 'Oraibi (36) from Abu Dis village, east of the city. The aforementioned civilian opened fire from his gun and the Israeli soldiers then opened fire at him. On the same day, Israeli police officers opened fire at 'Ezz al-Deen Rayeq 'Abdullah Raddad (21) under the pretext of stabbing someone in his car in the vicinity of al-Mesrarah area near al-Anbyaa' Street in the Old City in East Jerusalem. As a result, he was hit with several bullets from a close range and left bleeding to death. Israeli forces stationed at "Gilbert" military checkpoint, northwest of Tal al-Rumaidah neighbourhood, in the centre of Hebron, shot dead Taher Faisal Abdul Men'em Fanoun (21) and Mostafa Fadel Abdul Men'em Fanoun (16), both are from Jabal al-Rahmah area, south of Hebron. Israeli forces claimed that the 2 aforementioned persons attempted to stab Israeli soldiers. The 2 corpses were transported by a Red Star of David's ambulance to an unknown destination. Israeli forces killed in the afternoon a Palestinian civilian while going back home on foot to Aboud village, northwest of Ramallah. Israeli forces claimed that the killed person stabbed an Israeli soldier who was standing with other soldiers at the main entrance to the village. However, PCHR's investigations totally refute the Israeli story. According to PCHR's investigations and statements of eyewitnesses, an Israeli soldier opened fire at Abdul Rahman Wajih Ibrahim Abdul Majid (27) after the Israeli soldiers slapped him on the face. Due to which, Abdul Rahman pushed the soldier who stumbled and fell on his back. The Israeli soldier immediately fired 2 bullets at him. Two other Israeli soldiers opened fire at him as well. On the same day, Israeli forces stationed at the western entrance to Silwad, northeast of Ramallah, on Silwad-Yabroud road near bypass road (60), opened fire at a vehicle. As a result, the driver Anas Bassam Abdul Rahim Hammad (21) was killed after he ran over a group of Israeli soldiers at the entrance to the village. 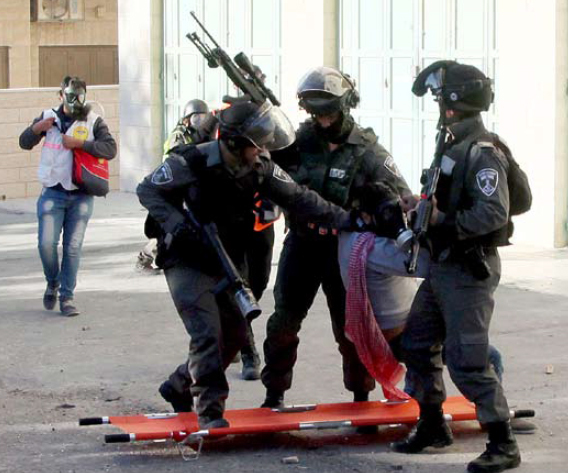 On 06 December 2015, Israeli police opened fire at 'Amer Yaser Iskafi from Beit Hanina, north of occupied Jerusalem. As a result, he was hit with several live bullets throughout his body and left to bleed to death in the scene although there were Red David Star ambulance crews in the area. On 07 December 2015, Israeli forces deployed in the vicinity of al-ibrahimi Mosque in Hebron killed Ihab Maswadi (21) from al-Sharif Mountain Area. They claimed that Meswadi stabbed an Israeli settler, and his corpse was taken by an Israeli ambulance to an unknown destination. The video shared on social media showed a number of Israeli soldiers and medical staffs offering first aid to the wounded settler. Meanwhile, Meswadi was lying on the ground for half an hour and none of the paramedics or soldiers approached him to check on him or give first aid. He was left to bleed to death. On 08 December 2015, during their incursion to al-Dheishah refugee camp, south of Bethlehem, Israeli forces killed Malek Shahin (18) when they heavily opened fire at dozens of Palestinian children, who threw stones and empty bottles at them. The aforementioned civilian was hit with a bullet that penetrated the forehead and settled in his head. Palestinian ambuaklnces were denied access to the camp and the young man was left to bleed for long. On 09 December 2015, Israeli forces deployed in the closed Shuhadaa' Street in the centre of Hebron killed 'Abdel Maswadi (21) from al-Sharif Mountain area under the pretext of stabbing two settlers. His corpse was taken by an Israeli ambulance to an unknown destination. During this week, 49 Palestinians, including 17 children, a journalist and a woman, were wounded. One of whom was wounded in occupied East Jerusalem and its suburbs while the rest were wounded in the West Bank Cities. In peaceful protests against Israeli policies: 22 Palestinian civilians, including 10 children, were wounded. Eighteen of them were hit with live bullets; and the four others were hit with rubber-coated metal bullets. In peaceful protests against Israeli incursion: 16 Palestinian civilians, including 5 children and a woman, were wounded. Thirteen of them were hit with live bullets, 2 others were hit with a rubber-coated metal bullet and one was hit with a gas canister. At the checkpoints and public roads: 8 Palestinian civilians, including a child and a journalist, were hit with live bullets and seven others were hit with metal bullets. In peaceful protests against the annexation wall and settlement activities: two Palestinian civilians, including a child, were wounded. The child was hit with a live bullet while the other civilian was hit with a sponge-tipped bullet. Palestinian civilians wounded in occupied Jerusalem: a civilian was hit with live bullets. 105 Palestinian civilians, including 25 children and 2 women, were abducted. 23 of them, including 13 children and the 2 women, were abducted in occupied Jerusalem. Israeli forces turned the West Bank into cantons and continued to impose the illegal closure on the Gaza Strip for the 9th year. Dozens of temporary checkpoints were established in the West Bank and other were re-established to obstruct the movement of Palestinian civilians. 7 Palestinian civilians, including a boy child and a young woman, were abducted at checkpoints in the West Bank. In the Gaza Strip, Israeli forces wounded 21 civilians, including 4 children. Eighteen of them were hit with live bullets, 2 with rubber-coated metal bullets, and one with a tear gas canister. All of them were wounded during protests. Moreover, 3 civilians were wounded during shooting incidents in the border areas in the southern Gaza Strip. North of the Gaza Strip: 4 Palestinian civilians, including 2 children, were wounded; two of whom sustained a live bullet wound, and the two others were hit rubber-coated metal bullets. Gaza City: 3 Palestinian civilians were hit with live bullets. Central Gaza Strip: 11 Palestinian civilians, including 2 children, were wounded. Ten of whom were hit with live bullets while one was hit with a tear gas canister. Khan Yunis: 3 Palestinian civilians sustained live bullet wounds. In the context of shooting incidents at the border area, on 04 December 2015, Israeli forces stationed along the border fence between the Gaza Strip and Israel, east of Khan Younis in the southern Gaza Strip opened fire at a bird hunter, who was near a landfill to the east of al-Fokhari village. As a result, he was hit with three live bullets to his hand, thigh, shoulder and right waist. The Israeli forces also fired two shells at the area wounding a civilian and his child with shrapnel. In the meantime, Israeli forces fired 3 artillery shells. As a result, two houses belonging to two brothers in al-'Amour neighborhood in al-Fokhari area were damaged, but no causalities were reported. The houses are around 2 kilometers away from the border fence. In the context of aerial bombardment, on 07 December 2015, Israeli warplanes launched two missiles at a training site belonging to Izzi al-Deen al-Qassam Brigades, east of al-Zaytoun neighborhood, east of Gaza City. Material damages were caused in the nearby buildings, but no causalities were reported. As part of targeting Palestinian fishermen, on 07 December 2015, Israeli gunboats stationed off al-Waha shore, northwest of Beit Lahia, and off al-Sudaniyah shore, west of Jabalia, north of the Gaza Strip, opened fire at Palestinian fishing boats sailing within 3 nautical miles. As a result, the fishermen were frightened and sailed back, but no casualties were reported. On 07 December 2015, Israeli gunboats stationed off al-Soudaniyah area as well opened fire at Palestinian fishing boats. An Israeli gunboat surrounded a fishing a boat manned by Zayed Taroush (19) and Mahmoud 'Omer (33) and then abducted the fishermen. They were taken to an unknown destination, and Israeli forces confiscated the fishing boat. On the same day, in a separate incident, four fishermen were abducted and their boat was confiscated. On next day dawn, they were released, and the boat was kept in custody in Ashdod Seaport. Israeli gunboats continued to target Palestinian fishermen in the Gaza Strip sea, but no casualties were reported. 6 fishermen were abducted and their 2 fishing boats were confiscated. Israeli Settlement activities continued in the West Bank. 27 dunums planted with olive trees and a greenhouse in Kafa area, south of Tulkarm, were demolished. On 03 December 2015, Israeli forces confiscated a bundle of wood and bricks used for construction work from a carpentry and brick workshop belonging to 'Ata Nabil 'Abdel Rahman Ghanem (35) on Bypass Road (60) between al-'Aroub refugee camp and Beit Ummar village, north of Hebron. Around the same time, a number of officers from the construction and organization department in the Israeli Civil Administration and Israeli soldiers raided and searched a store belonging to Fayez 'Azmi Faries Shammas (46) from Hebron near Ghanem store confiscated manual tools and a sewing machine after forcing Shammas to leave it. On 08 December 2015, Israeli forces levelled 27-dunum land planted with olive trees and a greenhouse belonging to Kafa area, south of Tulkarm without a prior warning. On Thursday afternoon, 03 December 2015, a group of Palestinian young men gathered in al-Taweel mountain area adjacent to “Psagot” settlement in al-Bireh village, to organize a demonstration against the Israeli policies and settler attacks. The demonstrators threw stones at the settlement’s fence, due to which, the Israeli soldiers stationed in the area fired live ammunition, rubber-coated metal bullets, sound bombs and tear gas canisters at the protesters. As a result, a 15-year-old male was hit with a rubber-coated metal bullet to his left knee. At approximately 13:00 on Friday, 04 December 2015, dozens of Palestinian young men gathered in al-Naqar neighborhood area near the annexation wall, west of Qalqilya, and threw stones at the Israeli soldiers stationed in the area. Due to which, Israeli soldiers fired live ammunition, rubber-coated metal bullets, sound bombs and tear gas canisters at the protesters. As a result, 2 civilians, including a child, were hit with rubber-coated metal bullets. Following the Friday prayer, on 04 December 2015, hundreds of Palestinians from Beit Ommar village, north Hebron, organized a peaceful demonstration demanding the recovery of the Palestinian corpses that have been kept in the Israeli custody. It should be noted that the number of those corpses reached 16 so far. The protesters raised Palestinian flags and portraits of victims, chanting national slogans. They then made their way to the eastern entrance to the village, where the Israeli soldiers established a permanent military checkpoint 10 days ago. The Israeli soldiers randomly fired tear gas canisters at the protesters. As a result, a number of protestors suffered tear gas inhalation. On Friday afternoon, dozens of young men gathered in the vicinity of Ofer Prison, west of Ramallah, to organize a demonstration against the Israeli policies and settler attacks. After which, the protesters made their way to the prison gate, so the Israeli forces closed the gate and deployed in the area. The protesters set fire to rubber tires and threw stones and empty bottles at the Israeli soldiers, who immediately fired live ammunition, rubber-coated metal bullets, sound bombs and tear gas canisters at the protesters. As a result, 3 civilians were hit with live ammunition to their lower limbs. Around the same time, dozens of Palestinian young men gathered at the southern entrance to al-Jalazoun refugee camp, north of Ramallah, near an UNRWA school for boys, 300 meters away from the fence of "Beit-Eil" settlement, to organize a peaceful demonstration in protest against the Israeli attacks in the oPt. The demonstrators threw stones at the settlement fence, due to which, Israeli forces stationed in the area fired live ammunition, rubber-coated metal bullets, sound bombs and tear gas canisters at the protesters and then chased them into the camp. As a result, a 39-year-old male sustained a live bullet wound to his stomach and a 14-year-old male sustained a live bullet wound to his right thigh. Following the Friday prayer, on 04 December 2015, dozens of Palestinian civilians from Bil'in village and Israeli and international human rights defenders organized the weekly peaceful demonstration in protest against the annexation wall and settlement activities. The demonstrators made their way through the village streets and then headed to the annexation wall. The Israeli forces had closed all the entrances to the village to prevent demonstrators from participating in the demonstration. The demonstrators walked along the cement wall and tried to sneak through the fence. The Israeli soldiers stationed behind the wall from the western side fired live ammunition, rubber-coated metal bullets, sound bombs and tear gas canisters. They also chased them into olive fields and between the houses in response. As a result, a 20 year-old male was hit with a sponge-tipped bullet to his head. Following the Friday prayer, Palestinians from Ni'lin, Budrus, al-Nabi Saleh and Kufor Qaddoum villages, northeast of Qalqilya, and west and northwest of Ramallah and al-Bireh, organized a peaceful demonstration in protest against the annexation wall and settlement activities. The Israeli forces fired tear gas canisters, sound bombs and rubber-coated metal bullets at the protesters to disperse them. No casualties were reported. At approximately 15:00 on Saturday, 05 December 2015, Palestinian civilians and Israeli and international human rights defenders organized a protest from the center of Kufor Qaddoum village, northeast of Qalqilya, and made their way to the eastern entrance to the village in protest against closing that entrance since the beginning of al-Aqsa Intifada with an iron gate. When they arrived at the gate, Israeli forces fired live ammunition at the protesters. As a result, a 16-year-old male was hit with a live bullet to his left thigh. At approximately 13:00 on Saturday, 05 December 2015, dozens of Palestinian young men gathered in al-Naqar neighborhood near the annexation wall, west Qalqilya, and threw stones at the Israeli soldiers stationed in the area, who immediately fired live ammunition, rubber-coated metal bullets, sound bombs and tear gas canisters in response. As a result, a 14-year-old male was hit with a rubber-coated metal bullet to his left ankle. On Sunday afternoon, 06 December 2015, dozens of Palestinian young men gathered at the western entrance to Silwad village, northeast of Ramallah, on the road between Silwad and Yabroud villages, near Bypass road (60), in protest against the Israeli policies. The protesters set fire to tires and threw stones and Molotov cocktails towards the aforementioned road and Israeli soldiers. Due to which, Israeli soldiers stationed in the area fired live ammunition, rubber-coated bullets, sound bombs and tear gas canisters at the protestors. As a result, a 17-year-old male was hit with two live bullets; the first bullet entered the bladder and exited the buttock while the other one entered the right forearm. The wounded civilian was taken to Palestine Medical Complex in Ramallah to receive medical treatment where he underwent an operation for 3 hours. His condition was serious but stable. At approximately 10:00 on Monday, 06 November 2015, a number of Palestinian young men gathered in front of an Israeli military camp established on the western lands of the Palestine Technical University “Khadouri”, west of Tulkarm, in protest against the Israeli attacks in the oPt. When the protesters arrived at the area, Israeli forces moved into the western lands of the university and then heavily fired tear gas canisters at the protesters. Due to which, the protesters threw stones and Molotov cocktails at the Israeli soldiers. Moreover, at approximately 12:00, the Israeli soldiers attacked a stone thrower and pushed him to the ground. Other protesters tried to pull and free him from their hands. At approximately 13:30, the Israeli soldiers raided the university campus and deployed between the buildings while opening fire. As a result, 11 civilians, including 4 children, were hit with live bullets and were then taken to Thabet Thabet Hospital in Tulkarm to receive medical treatment. On Tuesday 08 December 2015, dozens of young men gathered at the southern entrance to al-Jalazoun refugee camp, north of Ramallah, in protest against the Israeli attacks in the oPt. The protesters threw stones at the soldiers stationed along the border fence of “Beit Eil” settlement. Due to which, Israeli soldiers fired live ammunition, rubber-coated metal bullets, tear gas canisters and sound bombs at the protesters and chased them into the camp. As a result, Qais Mohammed Mahmoud Taha (10) was hit with a live bullet to the stomach; the bullet exited the right side of his back. The wounded child was taken to the Palestine Medical Complex in Ramallah to receive medical treatment where he underwent an operation for 2 hours during which part of his Intestines was removed. At approximately 13:00 on Friday, 04 December 2015, dozens of Palestinian young men headed to the border fence between the Gaza Strip and Israel, east of al-Shuja'ia neighborhood, east of the Gaza Strip. A number of protesters approached the fence, set fire to rubber tires and threw stones at the soldiers stationed along the fence. Due to which, Israeli soldiers sporadically fired live ammunition and tear gas canisters at the protesters. As a result, 3 civilians were wounded with live bullets. At approximately 13:30 on Friday, dozens of Palestinian youngsters headed to the border fence between the Gaza Strip and Israel, east of al-Faraheen area in 'Abasan village, east of Khan Younis, south of the Gaza Strip. A number of protesters approached the border fence, set fire to rubber tires and threw stones at the soldiers. Additionally, some of the youngsters tried to raise the Palestinian flags. Due to which, Israeli soldiers sporadically fired live ammunition and tear gas canisters at the protesters until the evening. As a result, 3 civilians were wounded with live bullets and were then taken to the Gaza European Hospital to receive medical treatment. At approximately 14:00 on Friday, dozens of Palestinian youngsters headed to the border fence between the Gaza Strip and Israel, east of al-Bureij refugee camp, in the Central Gaza Strip. The protesters set fire to rubber tires and threw stones at the soldiers stationed behind the sand barriers along the border fence. Due to which, Israeli soldiers fired live ammunition and tear gas canisters at the protesters. As a result, 10 civilians, including 2 children, were wounded. Nine of them were hit with live bullets while one of the children was hit with a tear gas canister to his left leg. The wounded civilians were taken to Al-Aqsa Hospital in Deir al-Balah. As one of them was seriously wounded, he was taken to al-Shifa Hospital. Wounds of the other civilians ranged between minor and moderate. Additionally, 6 civilians suffered tear gas inhalation, one of whom was a PRCS volunteer paramedic. At approximately 14:30 on Friday, Israeli forces stationed in Beit Hanoun crossing, northwest of Beit Hanoun, north of the Gaza Strip, fired live ammunition, rubber-coated metal bullets and tear gas canisters at dozens of protesters on the road between the Palestinian and the Israeli sides of the crossing. The protesters threw stones at the soldiers in protest to the Israeli attacks against the Palestinian civilians in Jerusalem and the West Bank. As a result of the clashes that continued until 17:30, 4 civilians, including 2 children, were wounded. Two of them were hit with live bullets, while the others were hit with rubber-coated metal bullets. Due to the number and severity of Israeli human rights violations this week, the PCHR made several recommendations to the international community. Among these were a recommendation that the High Contracting Parties to the Geneva Conventions to fulfil their obligation to ensure the application of the Conventions, including extending the scope of their jurisdiction in order to prosecute suspected war criminals, regardless of the nationality of the perpetrator and the place of a crime, to pave the way for prosecuting suspected Israeli war criminals and end the longstanding impunity they have enjoyed.